The Media Release below from the Murrawarri republic shows the way forward for our Aboriginal nations to claim sovereignty over their traditional lands. Michael Anderson then explains further that this action by Uncle Fred Hooper is not just a flash in the pan. (see below). i fully endorse the current push for the sovereignty of our nations. More independent Aboriginal states in the pipeline. Goodooga, 20 May 2013 – – Aborigines who have just met for two days in Brisbane are looking to launching their own independent states, as the Murrawarri people have just done in northwest NSW and southwest Queensland. “Clearly the people are now asking the pertinent questions relating to a process of asserting their continuing sovereignty as individual nations,” writes Michael Ghillar Anderson, Convenor of the Sovereign Union of First Nations and Peoples in Australia in a media release. The last surviving 1972 founder of the Aboriginal Embassy in Canberra says the Brisbane treaty talks were “one of the best meetings that has been held on a single national issue, that I have attended for many years”. Participants expressed great admiration for the steps taken by the Murrawarri Republic , Mr. Anderson writes, and they are now seeking further advice on processes they adopted for “this revolutionary action”. The participants would now make all efforts to follow the same or similar path. There is to be another meeting in five weeks to further investigate domestic and legal positions for establishing “our own statehood under international law”. It would be open to all people considering these actions, including non-Aboriginal supporters. Mr. Anderson points out that one thing holding people back from committing to the sovereignty movement is the question of citizenship rights and possible ramifications that may flow from it. But it was also important to understand, just as the Murrawarri Republic do, that they must also recognise the rights of their diaspora, that is, people who belong to that nation but choose to live outside of their Country, have the same rights as those living on Country, but are not immune from punishment for any offences committed against the law of the nation whose land they live on. Having attended a two-day Brisbane Treaty Talks conference and workshops on the continuing sovereignty of Aboriginal and Torres Strait Islander peoples, I can say that the meeting is one of the best meetings that has been held on a single national issue, that I have attended for many years. Clearly the people are now asking the pertinent questions relating to a process of asserting their continuing sovereignty as individual nations. They expressed their great admiration for the steps taken by the Murrawarri Republic and are now seeking further advice in relation to the processes that were adopted by the Murrawarri People to have taken this revolutionary action. The participants have consented unanimously to investigating the processes adopted by the Murrawarri Republic and will now make all efforts to follow the same or similar path. The participants of the conference and workshops know in their own hearts that this is what their Elders past have been seeking to achieve. Now the people are saying that now they need to make a greater effort to achieve what the Murrawarri have. A number of considerations were made and there will be a further meeting in five weeks time where we will further investigate domestic and legal positions that establish the legal foundation to establish our own statehood under international law. It must be pointed out, however, that one factor that does, in fact, hold the people back from committing to the sovereignty movement is the question of citizenship rights and the possible ramifications that may flow from it. One of the working points that was submitted in discussion was that, if post war immigrants are entitled to hold dual citizenship, which permits them to access all social benefits and then in retirement return to their own countries to live, such as Greece and Italy, and there continue to receive their social benefits, then so, too, can First Nations people within Australia have dual citizenship, that is they can be Anangu, Wokka Wokka etc and be Australians at the same time, thereby maintaining the benefits of that dual citizenship status. It was pointed out in the workshop that if Aboriginal people seek to declare their independence within their homelands, they need to return to Country. Only those who live on Country are in a position make such a Declaration of Independence. It is also important to understand, just as the Murrawarri Republic do, they also recognise the rights of their diaspora, that is, people who belong to that nation, but who choose to live outside of their Country, have the same rights as those living on Country, but are not immune from punishment for any offences committed against the Nation’s Law whose land they live on. An example of this is: if you are a Wokka Wokka citizen and you choose to live within the land of Jageara then you are subject to the Jagaera law if they have declared independence. If you are on land whose owners have not declared independence, then you are subject to the laws originating from Britain . The fundamental social factors, legal jurisdictions and methodologies for implementation each fit within the transitional process. The duration of the transitional process is not set, as there is a realisation that people are at different stages in their own understanding. But it was agreed at these treaty talks that information kits on sovereignty and independence be developed for circulation. It was requested that within this information kit a manifesto be created, pointing out all recent and past judgements in the law courts of the former British empire that go to recognising Aboriginal rights. It was pointed out that we must be cautious about espousing the UN Declaration on the Rights of Indigenous Peoples, as this Declaration requires First Nations Peoples to recognise the territorial integrity of the invader state. Alternatively, the majority of the rights defined in that UN Declaration are already included in UN Covenants and are recognised in international law. This includes the right of self-determination, without having to recognise the territorial integrity of the dominant state. Every State has the duty to refrain from forcible action which deprives peoples…of their right to self-determination and freedom and independence. In their actions against, and resistance to, such forcible action in pursuit of the exercise of their right to self-determination, such peoples are entitled to seek and receive support in accordance with the purposes and principles of the Charter. On the question of treaties, the participants agreed that the first step should be that those Aboriginal nations, who declare independence, should treaty with each other on each other’s recognition and commit to each to give support, if and when necessary in the formation of their state. No doubt future gatherings will locate other matters we each will treaty on. In relation to treatying with the Commonwealth Government of Australia, it is not in our interest to treaty with Australia at this point as our people first need to be fully informed about all their rights as sovereign and independent peoples. To those who have contacted me asking for the full article by gary foley re noel pearson, all i can say is that i’m attempting to do so. 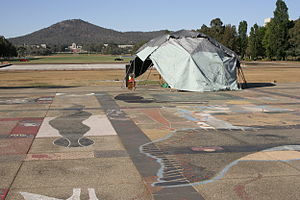 This entry was posted in News Archive and tagged Aboriginal Tent Embassy, Anderson, Australia, Australian Indigenous, Brisbane, Declaration Independence, First Nation, Indigenous People, Murrawarri Peoples Council, Royal Highness, United Nation, United States Declaration of Independence by renaissancelearningfoundation. Bookmark the permalink.